Maybe our inner doomsayer was too strong in preparing for last week’s frost, but we figure we’re better off safe than sorry. It turned out to be patchy frost and barely killed anything. But we’ve been caught off guard before though and it’s not fun — one frosty night can often be followed by 3 weeks of warmer frost-free harvest time, perfect for ripening peppers and those last tomatoes; once or twice we lost those crops (and more) unexpectedly and missed them dearly for those whole 3 weeks. So now we do everything we can to make sure that doesn’t happen again. Those were the years that taught us our farm can be up to 8 degrees colder than our forecast, since we’re at the bottom of our neighborhood hills. 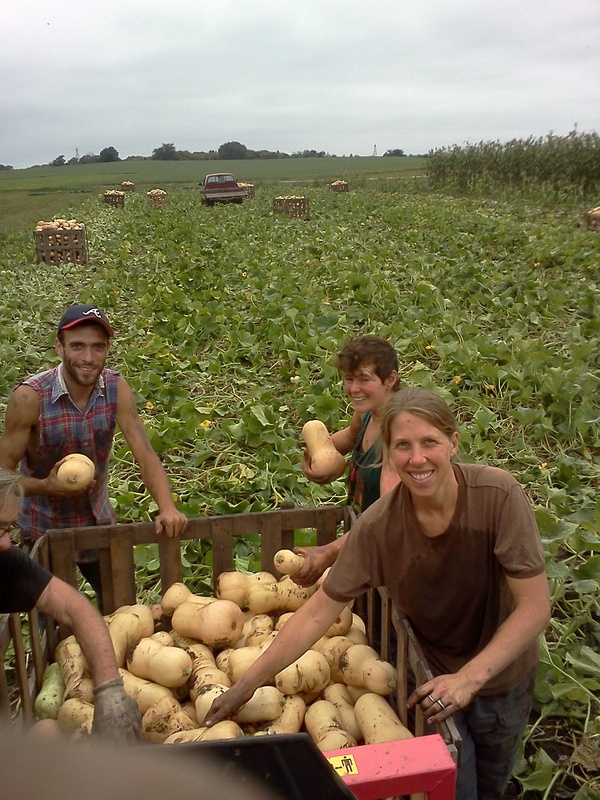 So we hustled for a week beforehand — two whole days with our hard-working crew to get the winter squash clipped, put in windrows then picked up into bins. It was a big and beautiful harvest, but they were so fast at it we even got to dig a few sweet potatoes to start the curing process in the greenhouse, so they’ll be in the share in a couple weeks. Then we pulled out a 1/2 acre worth of row cover to be ready to protect tender crops at the last minute — a few rows of tomatoes and cherry tomatoes, all the peppers, the remaining sweet potatoes, a couple rows of beans, napa cabbage, and some of the eggplant. It only took a couple of (very dusty and vigorous) hours, but after a busy week we were all glad when it was done, happy tired and knowing we’d done what we could. The two of us get to enjoy the last quiet moment before the first frosty night though. Since the wind often blows the covers off, sometimes more and sometimes less, and we left the cherry tomatoes and beans uncovered so Friday folks could pick them, we go out right before bed to make sure everything is all tucked in. It has become a sweet ritual — we don’t even bother to rush out of the house after dinner, since often the wind is still blowing a little until darkness settles in. The moon is often out on a frosty night, or at least the stars are shining brightly in the clear, dry air, and the row covers are white and easy to see, so there’s no need for the sun or flashlights. So we put on our winter jackets (!) and made the rounds of the farm, catching up with each other and having a chance to say a last thank you and maybe good-bye to so many of the plants. And to “remind” the carrots, spinach and kale to enjoy the cold, as it will make them sweeter for all of us to eat. The kittens joined us, sometimes snuggled in those jackets, and while we were taking a break under the stars we heard another meowing come out of the woods. “Q” came to visit, an older grey cat who charmed us all as a kitten and now comes to visit occasionally as part of his neighborhood rounds (Don’t fret, he’s fixed). We snuggled with them awhile, and were reminded that first-frost nights in September are more work than in October, but still just as beautiful. The new bigger greenhouse was a dream to work in this spring, and now is its other time to shine. The old one was sloped like the farm, so subtle that we barely noticed until we tried to push a 1,000 lb bin of squash up that slope. Well, until 2 or 3 of us tried to do it — while it was a step up from hauling the squash in 40 lb boxes, it was still a grueling job. Last week, with the level ground and concrete walkway, it was an easy one person job. And we didn’t have to rush to get the onions out to make room either — just take the squash right from the field into the safety of the greenhouse. There’s still room for improvement, but it’s great to be moving forward around here! We’ll keep picking and washing for you up until the end of October — the last share pickups will be the week of the 27th. That’s seven more weeks, so eat well all fall! And be sure to check out the info on the Storage Share and more, all found below the U-pick notes. Thanks for letting us grow food for you! The wet weather let up just in time, it seems, to stop the spread of plant pathogens in the spinach, lettuce, carrots, broccoli and cabbage, all places where those not-so-fun-guys were starting to get settled in. We — ie your fall veggies — love sunny dry days, and this approaching 70-75 degree forecast is exciting. It will help turn peppers and tomatoes red, help carrots, beets and other roots get bigger, and lettuce and spinach too, and it will help the squash and sweet potatoes ripen to peak flavor faster. Spinach is looking big and beautiful, just like we always hope for. This sun will be good for it, and though the frost didn’t add its sweetness yet, it still has its “grunts-of-approval” flavor package. Red Peppers should be in abundance, and tomatoes we’ll have a few for everyone for the next 2-3 weeks, depending on the return of frost. These, plus winter squash, are beautiful and definite signs that we are in fall, at least veggie-wise. The broccoli gap we mentioned last time looks like it’s happening this week, and the summer squash, zukes and cukes, though surprisingly still alive, won’t make much fruit from here on out. So to fill those slots on the table we’ll have more peppers, plus celeriac and napa cabbage. Broccoli has surprised us before by growing fast, but we might have lower the bag size until the broccoli comes back or the winter squash cures to better flavor. Hopefully we’ll have some acorn and carnival that taste great next week. Outside the barn you’ll have a choice of a pie pumpkin, jack-o-lantern, or bigger squash. There are big jack-o-lanterns plus a few white pumpkins (we’ll grow more if they’re popular), blue hubbard squashes (blue-grey, oval and bumpy–great for stuffing, but wait a month or so to use it), and a few birdhouse gourds (green and goose-neck shaped). There will be more pie pumpkins available later too. Celery snuck through the frost but soon we will supplement it with celeriac, aka celery root. Celeriac adds a subtle celery flavor to many dishes, including mashed potatoes, colorful mixed root mashes and hashes and, in our kitchen to soups. To use, cut in half and peel the outer skin. For adding to mashed potatoes, cube and add to boiling water about 5 minutes before potatoes, since celeriac takes a little longer to cook. Celeriac can be cubed to mix with carrots, beets, parsnips, baby potatoes etc to boil and mash, or to roast; and grated to mix with other roots to fry into a hash. It is a knobby, funky looking thing but quite versatile and a good friend in the fall and winter kitchen. Melons are done for the year. It could have been both better and worse, but overall was much better than we expected when it started. Those last ones were getting pretty bland due to the 3-times-a-week rain. But the cantelopes were really good for 2-3 weeks, and we’ll try again next year! The kale is from a younger planting and more tender and sweet — the colder the better for the curly kale. Onions, hot peppers, greens and lettuce should carry on. It’s fun to think of your kitchens bursting with all this color and bounty! Raspberries survived the frost just fine, this should be a wonderful swan song for them. We’re barely seeing any bugs, and it looks like they’ll all get a chance to ripen. Cherry tomatoes slowed down at the end of last week, but should pick up by the end of this week. There are still lots of little green tomatoes out there. Green beans are still alive. Most of the beans can be found in the eastern 2-3 rows of the big patch, and there are a more coming in the rows next to the flowers. Herbs — Basil actually survived too. There wasn’t much left though, as it had been sick, picked hard, and we encouraged people to pick even harder before the frost. Maybe it’ll grow back a little, we’ll see. All the other herbs and flowers fared well too. We apologize for the excess weeds in the herbs and flowers; we’ve had a hard time keeping up with the weeds in many corners of the farm this year. We’ve learned some interesting things about weeds though; the hard way, of course. This week’s selection is : Lettuce Mix and/or other Salad Greens for $5 / lb, Spinach $4 / lb, Carrots, Beets and Celeriac for $1 / lb, Kale for $3.50 / lb, Globe Eggplant $1.50 / lb, Cabbage for $0.70 / lb (the big heads are about 3 lbs each), Green Bell Peppers or Red Peppers $2 / lb, Garlic $1 / head. Tomato boxes will be hit or miss as ripening fluctuates with the temps, feel free to check with us. Next week we will start handing out renewal letters for next year. Deposits or full payments can be given to us in the barn or mailed in. There’s lots of 2014 left still but we like to give you plenty of time to plan — it’s easier for us to do sign-ups this year, too. The letter will have more details. As always we encourage your feedback, thoughts, questions etc and look forward to another year with you! Every year Bon Appetit (the foodservice company for both St Olaf and Carleton) has a company-wide challenge to their staff to provide a meal with 100% of ingredients grown or produced within 150 miles of the cafe, and the only exception is salt. The college cafeterias are always open to the public and are a good deal for an exceptional meal, but the Eat Local Challenge days it’s extra interesting to see what they come up with and how they highlight our region’s food production. There’s a special feature this year: Bon Appetit’s local buying program is called “Farm to Fork” and challenges their kitchens to routinely buy 20% of their ingredients from producers within 150 miles. In honor of that program’s 15 year anniversary they are giving grants to farmers under the name “Fork to Farm.” See the “Fork to Farm” details on their website by clicking here. Now, we are no good at self-promotion, but the grants are being given away based on customer voting on the 23rd, and we are one of the finalists in the Midwest region. We’ve been pretty private about this so far, but this year we are building a large root “cellar” (though it’s aboveground) and we are also lined up to purchase 15 acres east of our driveway (from the driveway all the way to Hwy 3.) We’ll talk more about these two big changes in the next newsletter. To read some about it and why we applied for Bon Appetit’s $5,000 grant, click here and scroll down until you find our farm name. In short, we thought an extra $5,000 would help with cash flow in a year when we’re undertaking some big projects — the root storage facility and its equipment, purchasing land, and paying our employees fairer wages. So if you go, you can eat a great and creative meal, and vote for Open Hands Farm to be a grant recipient. St Olaf’s cafeteria is called Stav Hall and is located in Buntrock Commons, next to the college library. Carleton has two –one in Burton hall, and one in the Language and Dining Center. They are all often busy places, as they serve so many people, but the food is excellent and it’s a fun experience. The Sogn Valley Craft Fair is a hoppin’ place with great artists and craftspeople, plus some food and music. Even if this isn’t usually your kind of thing, it’s a sweet way to spend part of a fall day. You’ll probably see people you know, wandering around or selling their goods. You’ll see us selling veggies if you go on Saturday, as they’ve always had a farm theme, and like to have fresh organic produce plus pumpkins and dent corn, honey from the beekeepers that keep our bees (Homestead Apiary), jams and other canned goods to keep the farm connection. There’s a pottery studio to tour (in an old granary), plus fascinating blown glass, paintings, photos, metalworks, wood carving, puzzles, jewelry, toys — on a farm in Cannon Falls, it’s a great place to wander, and shop for gifts. The website is www.sognvalleyartfair.com, the street address is 35200 County 24 Boulevard, and we have postcards in the barn with a map and directions. Please be more mindful of your trash on the farm — we’re finding more than usual on the driveway and in U-pick areas. If you see some, feel free to pick it up too. Thank you! Last share pickups are the week of Oct. 27th. Toss all ingredients together until dressing is evenly distributed. Chill before serving. Serves 6. Here’s a variation on a classic that just might be better than the original. Traditionally, scalloped potatoes are cooked in milk or cream; here, however, we cook them in stock, and the result is a more flavorful and delightfully lighter dish. The celeriac adds a brightness that assertively sets the dish apart from its classic cousin. 1. Preheat the oven to 350° F. Grease a 2-quart baking dish with butter. 2. Place the celeriac and potatoes in alternating layers in the baking dish, seasoning every few layers with salt and pepper. At about the halfway point, add 1/3 cup cheese in an even layer; sprinkle with the thyme. Continue with the celeriac and potatoes, until you have used all of your slices (don’t go all the way to the top edge; leave a little room to allow the liquid to boil). 3. Pour the stock over the celeriac and potatoes. Dot with butter. Cover with foil and bake for 45 minutes. Remove the foil and bake for 15 minutes more. Sprinkle the remaining 2/3 cup cheese over the top layer, add several grindings of fresh pepper, and bake until the cheese turns golden, about 15 minutes. 4. Let stand for 10 minutes before serving.